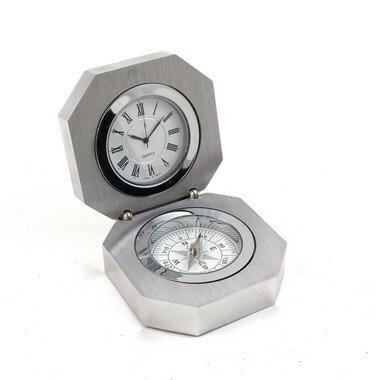 2 IN 1 CLOCK AND COMPASS GADGET IN HEAVY STAINLESS STEEL CASE WITH TARNISH PROOF AND BRUSHED FINISH ELEGANT SURFACE. HIGH TECH QUARTZ MOVEMENT OF CLOCK AND PRECISION COMPASS TO ENHANCE YOUR OFFICE MORE ELEGANT AND SPARKLINGLY STANDOUT. 1.25" x 3" x 3"